The Food and Drug Administration recently issued a report on the modernization of current good manufacturing practices (CGMPs) for food. Based on that report, FDA is clearly moving forward, at a measured pace, with an effort to amend the food GMPs. In 2002, FDA formed a CGMP Modernization Working Group to determine if the agency's food GMP regulations are in need of updating. The working group was asked to consider any new controls that would have the greatest impact on food safety. The food GMP regulations have been around since 1969 and were last revised in 1986. Unlike the medical device GMPs, there is no explicit authority in the Food, Drug, and Cosmetic Act for FDA to establish GMP regulations governing food. These requirements are derived indirectly from the statutory prohibition against preparing, packing or holding food under "unsanitary conditions." The current food GMP regulations are intentionally broad, so they can be sensibly applied to a wide variety of food processing operations. The philosophy behind these regulations is that the food industry must use up-to-date standard operating procedures aimed at minimizing the risk of contamination. This places a burden on food manufacturers to know what is "current" and what is "good." FDA has solicited public comment on the modernization of food GMPs. Many of the comments urge FDA to maintain a flexible approach, allowing the food industry to adapt to new science and new technologies. Some comments point out the existing food GMP regulations are least effective in those areas where they are most specific. For example, the regulations mention maintaining refrigerated foods at 45°F or below. This is now considered out of date and inconsistent with FDA's Food Code, which specifies 41°F. Training for supervisors and workers. All food processors would be required to develop and maintain written sanitation procedures covering, at a minimum, all food-contact equipment and surfaces. 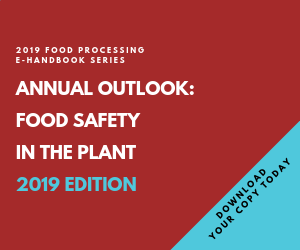 Processors of ready-to-eat foods that support the growth of Listeria monocytogenes may need to perform microbiological monitoring of production and packaging areas and maintain records necessary to judge the effectiveness of the program. Facilities at which any of the eight major food allergens are handled may be required to have a written allergen control plan. This would include elements such as training, segregation during storage and handling, validated cleaning procedures, prevention of cross-contamination and label review. The existing GMP regulations specify that workers must have appropriate education and training to perform their jobs. FDA may expand upon this to require food processors to maintain records to document training for each worker. Another important issue FDA will consider is whether the food GMP regulations should be extended to facilities engaged solely in the harvesting, storage or distribution of raw agricultural commodities (i.e., farms). Farms currently are excluded from the regulations, but may play an important role in preventing foodborne illness. Notably, most of the modernization opportunities FDA has identified involve some form of written documentation or recordkeeping. This suggests strongly FDA is thinking about its ability to enforce the food GMP regulations efficiently. This will undoubtedly spark some debate about FDA's authority to access relevant records as part of a routine inspection. Historically, FDA's ability to enforce food GMPs has been limited by the ability of inspectors to observe conditions and practices. Today, the agency often sends warning letters to seafood processors stating they are in violation of the hazard analysis and critical control points (HACCP) rule because their facility lacks a written HACCP plan or has failed to maintain appropriate records. It's easy to imagine numerous similar warning letters alleging food GMP violations if the regulations are amended along these lines. There will be plenty of time for the food industry to consider and comment on FDA's ideas as the agency moves forward at a deliberative pace. The proposed dietary supplement GMP regulations, for example, have been pending for many years. Several months ago, former FDA Commissioner Lester Crawford joked he might be out of a job if the dietary supplement GMP regulations were not finalized before the end of 2005. His prediction turned out to be somewhat accurate, but unfortunately not in the way we expected.